Robert Irwin’s Central Garden is a living, changing artwork. The garden has three planting seasons—summer, winter, and spring—and each transforms the look and feel of the space. 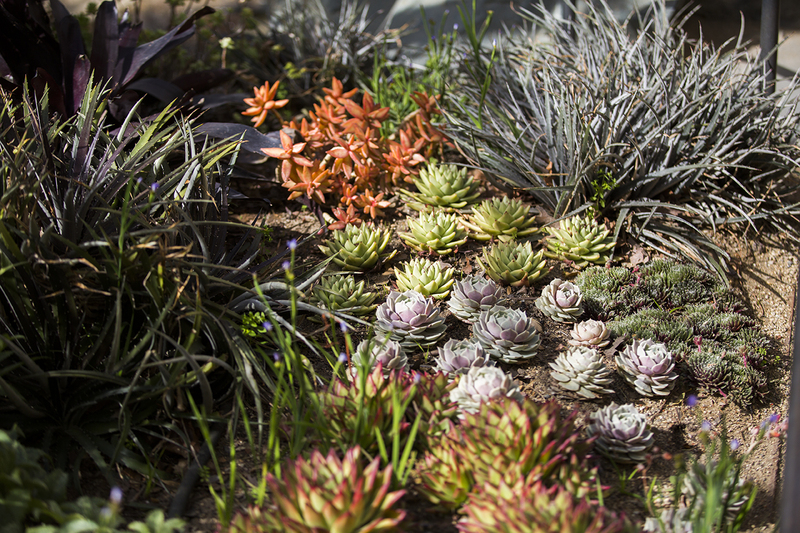 While shrubs, succulents, and trees always remain, annuals, smaller perennials, and other seasonal plants are added or subtracted for a new look. Spring is a time to rebalance form and color, trimming back wintry branches and grasses to make room for flowers. I spoke with plantsman Jim Duggan, who has worked on the Irwin garden for some 20 years, about what’s involved and what visitors can look out for in the coming weeks. The Central Garden has two main parts, the stream garden and the bowl garden. The stream garden is a celebration of leaves, while the bowl is a celebration of flowers. Robert Irwin’s vision, Jim told me, was to have a low-growing, carpetlike effect in the upper part of the stream garden. That’s why you’ll see so many kinds of succulents and grasses here. 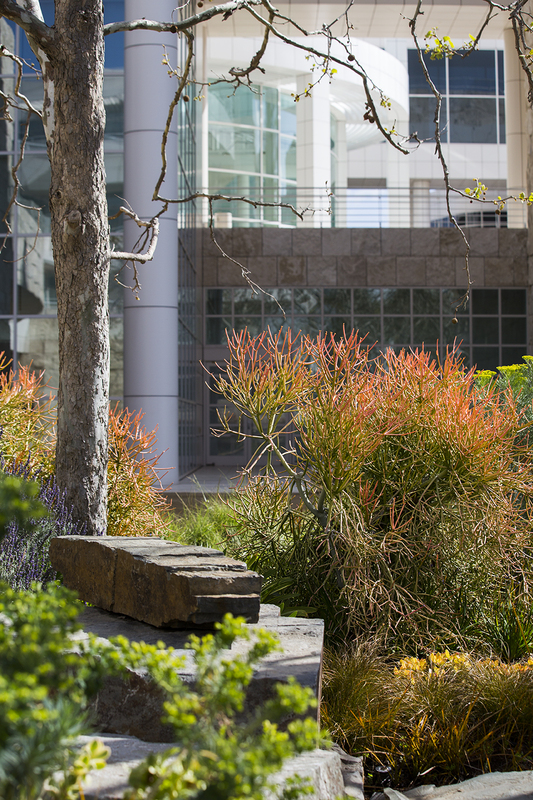 A new plant for the Getty this spring is carex, or sedge (a grasslike plant with shinier and more robust leaves). 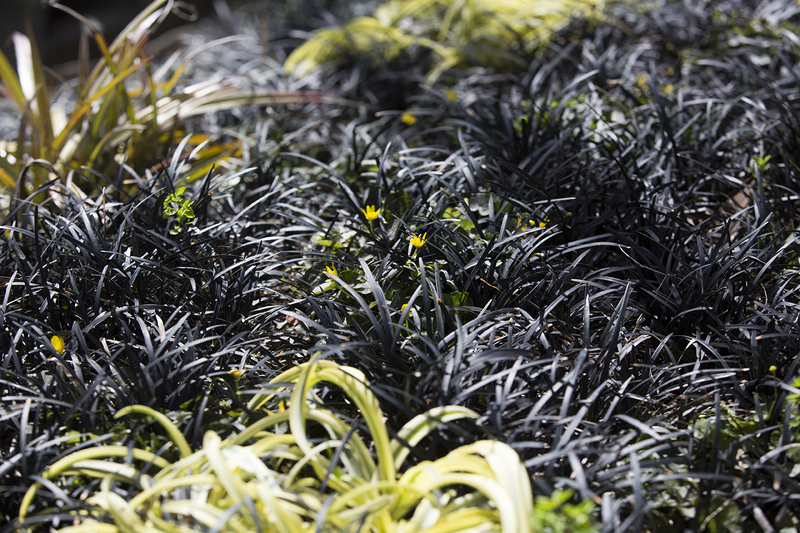 This carex cultivar has a gray, frosty coloring, a perfect tonal match to the cool tone texture the upper stream garden calls for. Jim told me about a painting that caught his eye at a retrospective of Robert Irwin’s work a few years ago. 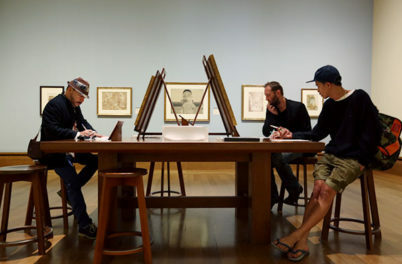 “It was about 18 inches on either side with heavy gray impasto covering the canvas,” he described, “but in one area he had scraped the impasto away to reveal a bright orange.” A similar effect is revealed in the Central Garden as well. Irwin believes there are no bad colors—it’s all about how you use them. Many people think orange is a hard color to use, Jim noted, but if you look around the garden, you’ll see it’s one of Irwin’s favorite “kicker colors” to add a delightful pop of color. 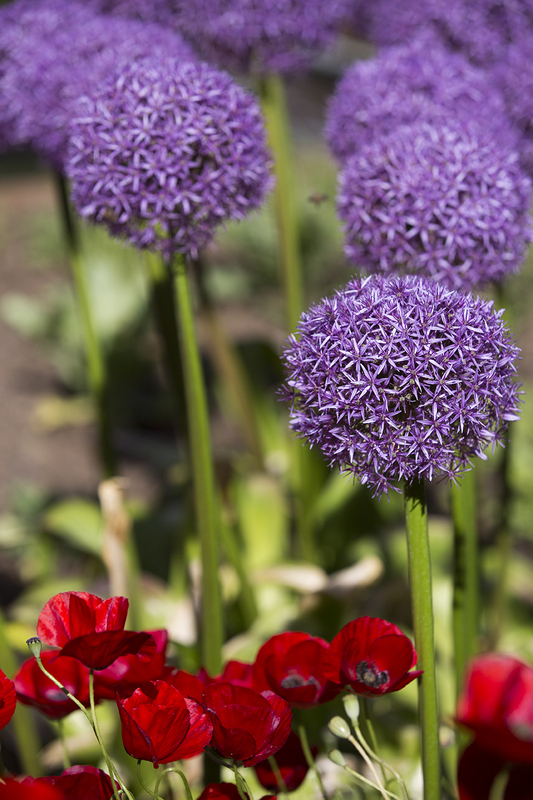 Some may say purple and red clash, but you’ll find the colors together planted in harmony. 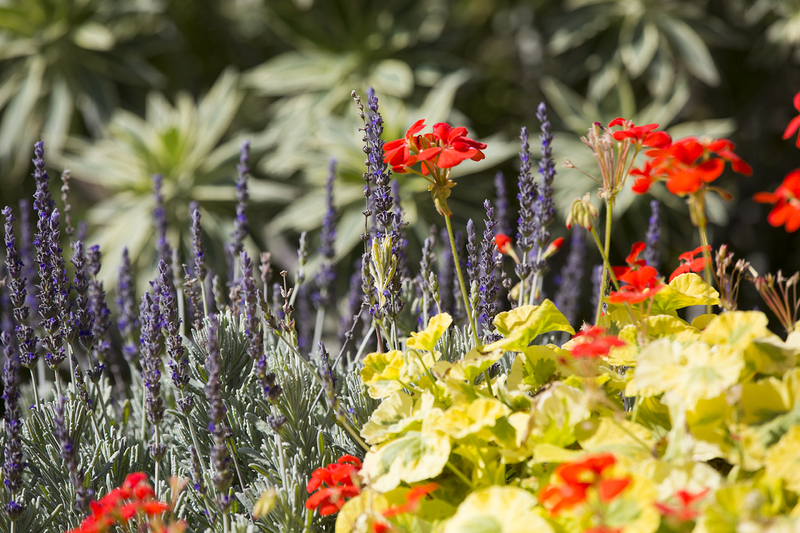 Flowers and foliage with strong reds, oranges, and yellows are preferred over varieties with striped or pastel colors to really punch up vibrancy in the spring. 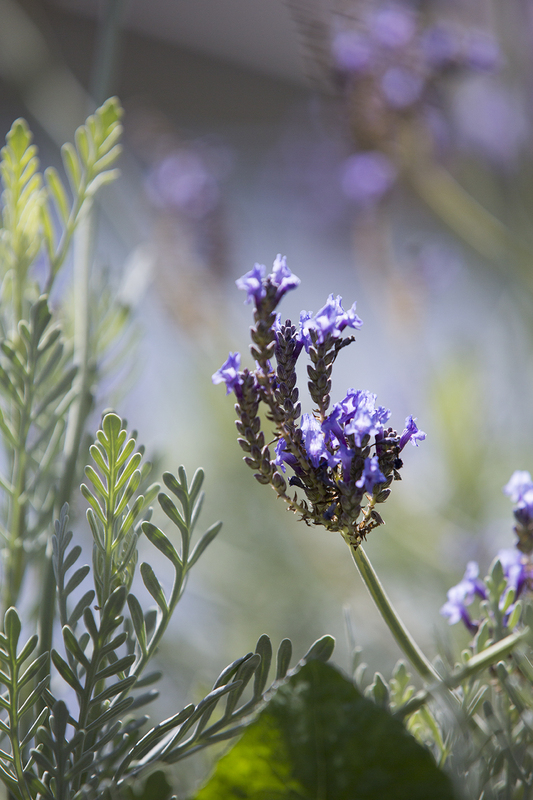 More California natives have found themselves at home in the garden in recent years. You’ll see tidy tips, cream cups, baby blue eyes, and a mix of colorful poppies. And amongst these flowers, interesting silver and cool-toned foliage adds surprises and contrast. 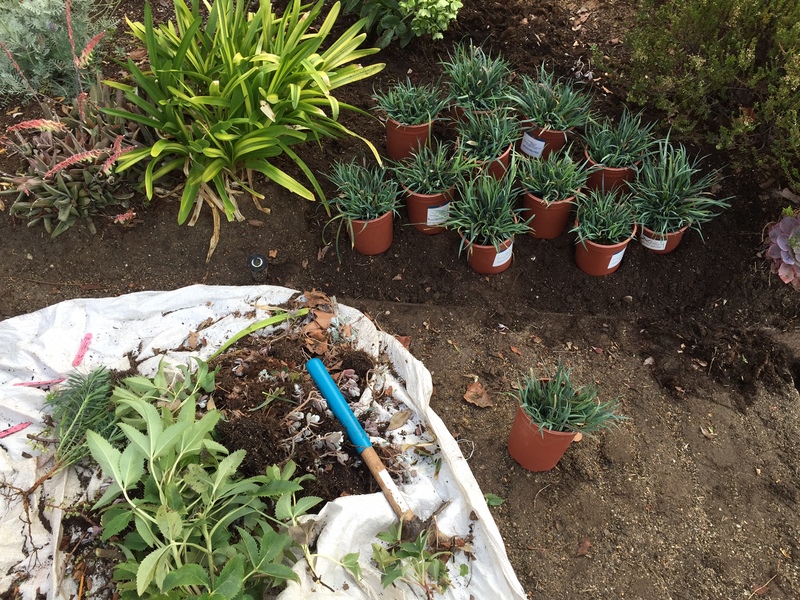 The garden team goes out on plant-finding missions a few times a year to find new plants that will work within the Central Garden’s aesthetic and are also drought-tolerant. 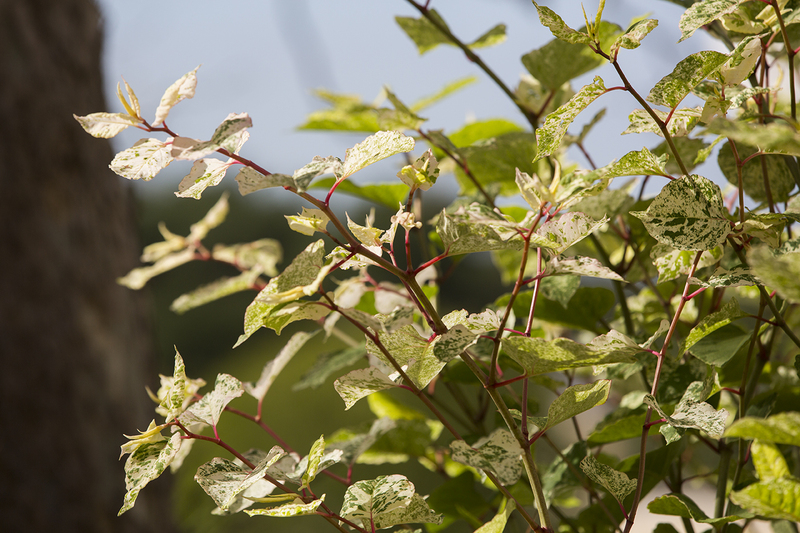 Visitors from Oregon may recognize Fallopia japonica, a plant with speckled leaves and red stems, as a pesky weed in their area. 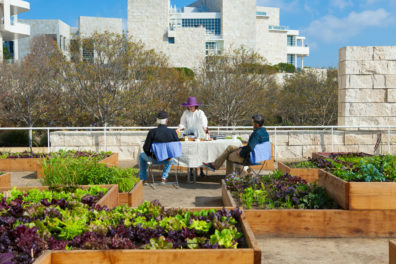 But because of Southern California’s dry climate, it stays well-behaved in the Central Garden. These little yellow flowers are a beautiful kicker color against the black mondo grass foliage, but in many wetter places in the world this Ranunculus cultivar ‘Brazen Hussy’ (yes, that’s its real name!) is a noxious weed that spreads too quickly.